Apple just released the very latest Mac OS X Mavericks 10.9.3 publicly after a number of beta releases. The beta were seeded to Mac developers from time to time in order to further improve the update. The latest Mac OS X Mavericks 10.9.3 brings some major updates and fixes to the OS. In the highlights, this latest OS X Mavericks 10.9.3 brings better support for 4K displays and the gives you the ability to sync contacts and calendars with your iOS devices using USB connection. You can update to this latest Mac OS X 10.9.3 from the Mac App Store in the Updates tab or from the Apple Menu > Software Update. 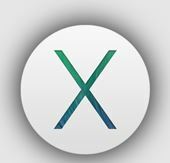 Here’s the Mac OS X Mavericks 10.9.3 Direct Download link (461 MB): direct download link. Apple’s latest Mac OS X 10.9.3 can possibly be the last public release of 10.9.x as the major OS X update 10.10 is expected to be showcased at Apple’s Worldwide Developers Conference (WWDC) in June this year along with iOS 8. Apple is highly expected to introduce some major design changes with OS X 10.10 following last year’s design overhaul of iOS 7 for mobile devices. Till then, Mac OS X 10.9.3 does the job of keeping us up to date, synced, and fixed!